Blake (31), looks drained and exhausted. He spent most of the week working late and rising early, traipsing in and out of the High Court with his father. Blaise (27), is apprehensive. Like her brother, she's never done an interview before and she's anxious that she gets her message across. Their parents, Brian and Mary Patricia O'Donnell, or Mary Pat as they call her, used to own a €1bn property portfolio and are now bankrupt. Their home used to be Gorse Hill, the fabulous house overlooking Killiney Bay, until midday last Monday, when the courts ordered the children still living there to move out so that Bank of Ireland can repossess it. They are here for one reason only, to tell their side of the story that entertained, amused and bemused the nation in a running soap opera all last week: the siege of Gorse Hill. And what a story it was. The O'Donnell parents blockaded into Gorse Hill by a motley crew of New New Land League supporters, Bank of Ireland hammering trespass orders to the gates, Vincent Browne, the broadcaster "storming the gates" to go on a tour of the grounds with his TV3 cameraman, treating his viewers to the footage of this exclusive property on his television show that night. Commentators asked why on earth the New Land League would want to help them while others dismissed the family as part of "a pampered elite". Gripping stuff, but not for the O'Donnells, whose lives have changed utterly. Blaise and Blake O'Donnell watched the siege from afar. "We can't re-enter the house or we'll be in contempt of court and could be put in jail," Blaise told the Sunday Independent. "We haven't been near the place since that Sunday. It's only what we see going on and it looks absolutely like a circus. It was very difficult and stressful but the circus going on outside was created by the media, not by them or us," she added. "I think we don't really understand why they [their parents] are so interesting, considering we've never had any profile even before all the litigation started in 2011. No one would have known Brian or Mary Pat at all. "No one would even have been able to identify them because they were never around town or anything like that, so it's all very odd to us why this is all so interesting, considering that there are other people and other families in the country who had a high profile prior to the downturn." As for Vincent Browne's stroll through the garden, "I think what he did was over-the-top and ridiculous and he behaved poorly. I would say I don't know how he would have behaved if it was done to his house." Her family are certainly in a "strange situation". "I'm sure I would too. It's human nature. But the people who know us well know exactly what we're like, they know us the whole way through and nothing has changed in the way we behave from 10 years ago to now." Brian and Mary Pat O'Donnell - a corporate lawyer and a psychiatrist - met at college in Galway, married and had four children. Blake, the eldest, is based in London, a qualified solicitor but he's working in property consultancy. Bruce (30), is in Dublin. Blaise, who studied commerce at UCD and has an MA from the Smurfitt Business School, and Alex (23), is in her final year in Trinity College Dublin studying genetics. As of last week, Blaise, Bruce and Alexandra are all "camping" with friends. They are aware they are perceived as "rich kids". "Absolutely, and I'm sure if the tables were turned...."
Blake cuts in: "I'd like to just say we're not rich" then adding, "we weren't rich at the start". As for the house, which the New Land League's Jerry Beades described as "bog standard": "I think what Jerry was saying was in terms of the house, it's a beautifully designed house," said Blake. "But it doesn't have all the bells and whistles," cut in Blaise, "and the interiors aren't lavish, as seems to be bandied around. I think this is the word of the week: lavish. It just isn't the case. I think Jerry was trying to make clear that it's a house with normal amenities." It does have a swimming pool, though. "Yeah, ok, we understand that. We're not trying to deny it's a nice house, we understand that," she said. But it's showing wear and tear. "The resources haven't been there to maintain somewhere like that over the past few years," said Blaise. Their life was "normal" before 2011. "We all went to school. There was a huge focus on academics," said Blaise. "I suppose, because the media portrays us in such a way that our side of the story is never told, we are always wrong, and that gets into people's heads, you know? So when you are constantly reading media and it's always saying you're wrong, you've done this, you've done that, you owe this, and there is never your side of the story, ever being printed or spoken about, people obviously make judgements," she said. As children they didn't know what their parents were worth (€1.1bn and a rich list entry at the height of their wealth). "No. We didn't have a clue. We had no idea we owned the house. Our parents kept that from us because they didn't want us to know. They wanted us to get on with our lives and do things, and not think we were entitled," said Blake. Life was "boring" and "normal" they said. That changed in 2010, with the economic downturn. Business was bad, and Blake, who had qualified as a solicitor, started working with his father in his law firm. "The business was bad. He needed help. And I was qualified, so I went in to help my father because he needed my support. "We knew things were financially difficult," he said, but even then, "we had no idea the nightmare was coming". The day before Christmas Eve in 2010, Bank of Ireland issued proceedings and "things went absolutely beserk," he said. Only then, while helping his father to review the documents, had Blake learnt that their home was in jeopardy. "My parents always kept their finances and everything private, to themselves. So I only became aware of the scale of it, properly, over that Christmas," he said. That's also when he learnt about how his parents put Gorse Hill in the ownership of a company, which was in turn owned by a discretionary trust set up in favour of their children. He told his younger siblings only in broad terms that "the situation is bad". The following year, Brian closed his firm and the couple moved to England after being over and back there for years, according to Blake. "They wanted to go and do an Individual Voluntary Arrangement (IVA) which is where you... ask your creditors to see if you can negotiate some sort of work out (of the debt)," he said. "No one wants to go into bankruptcy." While they were in the UK Blaise, Bruce and Alex held the fort at Gorse Hill. "The situation was fraught, and you're trying to make your own money and stuff," said Blaise. They were "on edge all the time" because they never knew when the next summons server would appear at the front door. And then there were what Blaise calls the "dawn raids". The first was in April 2012, when the bank's solicitors sent out a team to itemise all the valuables. "I was going out to work and I was driving out the front of the house, and there were four people standing there," she said, two bouncers, a junior solicitor and a note taker/trainee. "He (the solicitor) was waving papers at me. I'd never been in a situation like that before in my life. I was trying to get out the door to get to work. So I opened the car window a little bit and he flung the papers in on the dashboard and said: 'You've now been served.' I didn't know what to do. I rang Blake, I think. He was in London." "I didn't know what to do either," said Blake. The inventory took eight hours, she said. "I had to ring work and say I had an emergency," she said. "They asked to look inside my drawers. The solicitor was trying to pick out things in the bedroom that might be of interest. The valuer was there, taking notes and photographs of absolutely everything. It was a dawn raid, people poking around your bedroom. It was pretty horrendous. Then you think that won't happen to you again... and then it happens again." One morning last month, she awoke at 7am to knocking on the door and shouting through the letter box. It was the bailiffs sent on behalf of the official assignee supervising her parents' bankruptcy. "They took furniture and some paintings and that was it," she said. As for other valuables, "we don't really have jewellery and watches, we don't have any of that stuff". Their parents' difficulties have taken a huge toll on the family. "It's nothing but hassle. We don't talk about anything else. We live it every day. There is always something around the corner. As Blake said, you never know what they are going to attack you with next," said Blaise. "Everyone is tired, and it obviously is wearing. But there are loads and loads and hundreds of other people going through the same thing," she said. Their parents have the added upset of seeing their children sucked into this ugly litigation. "We are where we are," said Blaise. "We try not to get into that side of things. Everyone needs to stand firm and stay strong and keep putting one foot in front of the other. So if you bring things down to that level, it's not going to help anyone, especially when Brian and Blake have to keep their composure (in court)," she said. She acknowledges that her parents' debts are in a different league to the usual cases championed by the New New Land League, whom both hail as heroes for their family. "Everything has to be brought back to scale. I suppose it's easy from the outside, looking in, to say can you really see it from their side? And I understand why with the scale of it, and the amount borrowed," she said. "But at the end of the day, so many people are in a similar situation and it's just different amounts of money but the same principles apply." They are not giving up, even though it seems the odds are stacked against them. 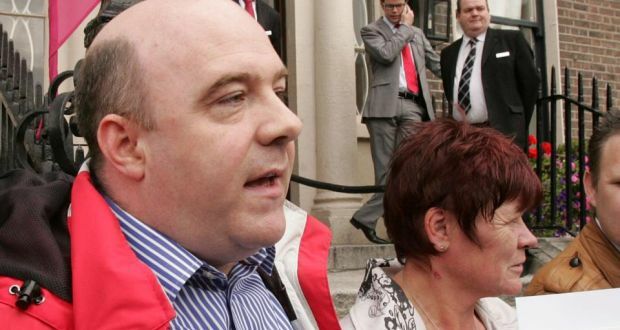 Tomorrow, the O'Donnells will be back in court when an application will be made to annul Mary Pat and Brian O'Donnell's bankruptcy, questioning its legal basis. They are also pursuing other legal possibilities. The stress levels are through the roof. It's only bricks and mortar at the end of the day. Why don't they walk away? "Because we don't feel that we should. Just because they're the bank doesn't mean they're right," said Blaise. But the High Court and the Supreme Court also think the bank is right. "Okay we won't get into that but we feel all the points we're bringing are correct. So sorry, you may want us to go away and walk quietly into the night, but at this point of no return, we've decided we are not doing that. It's a decision that we are all behind and we've come this far," she said. "We are going to put our case forward. The courts will decide," said Blake. Tom Darcy Speaking at Meath Land League meeting in Trim on 16th December 2014.